So SO Behind on Stuff + Bandage | personal.amy-wong.com - A Blog by Amy Wong. It’s also directed by Takeshi Kobayashi… who produces great music. Alas, Bandage is not that great at storytelling or characters. It tells the story of a fictional J-rock band called LANDS in the early 90s. What really REALLY bothered me was that the film didn’t look like the early 90s to me. It OCD bugged me. The only thing that remotely made me feel it was the early 90s — besides using a discman and sharing cds — was the phone at the female protagonist’s home. In one of the sequences, you can even listen to a track by Salyu as scene background music, and her music didn’t come out until Lily Chou Chou in 2001. OCD bugged me! And shall I tell you that Ayumi Ito was my favorite part of the story? LOL Okay, I might be biased, but I didn’t care for the brooding artists, even though I love brooding characters. Kii Kitano, who played lead on HALFWAY, played Asako here, the girl who becomes a fan of LANDS’ music and ends up meeting the band… hence meeting the lead singer Natsu, and becoming his Yoko. LOL – Their words, not mine. I’m still not warming up to Kitano’s on-screen talent or charisma… I mean, she must have something, right? Iwai keeps using her for some reason. But she’s just so blah. 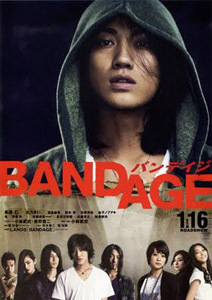 Jin Akanishi plays Natsu — who recently became an ex-member of KAT-TUN to pursue his solo career, this is his debut film role — the brooding lead singer of LANDS, the struggling band. They’ve been together for 15 years (if I recall), but they never had a huge hit… until they do, and then the band struggles. Kengo Kora — who can be seen in Aoi Miyazaki’s Solanin, and the recent Norwegian Wood — plays Yukiya… the McCartney to Natsu’s Lennon. So you can imagine. Yuki Shibamoto plays Arumi, the talented keyboard and arranger… but she doesn’t do much other than storm out of rooms and make dramatic entrances. Once again, the only thing saving this from doom was Ayumi Ito playing Yukari (her last name), former drummer and now LANDS’ manager. We didn’t get to know much of her, but every time she was on screen, she pulled attention towards her without doing much. What’s still on the queue of “to watch” “to listen”? The Yellow Handkerchief, That Evening Sun, Paper Man, Mr. Nobody, Kamome Shokudo, Donju… and I still can’t finish Maboroshi no Hikari. I’ve tried to watch it twice… so I’m trying to find the proper moment. What else to watch? Jdrama… American shows. Too many hours! PLUS! The stuff I got from Amazon… including 6 books, and The Complete Dead Like Me set. btw, Hachimitsu to Clover fue mas pasable la 2da vez q lo vi. La primera me cayo bomba LOL – Sho Sakurai me parece blah. Aunq antes no sabia q estaba en Arashi, asi q no me pueden acusar d subjetiva.